When I saw the lookbook a week or so ago, I instantly did a double take and thought, "Is that Rosalind?" And sure enough it is you! The resemblance was too striking to be anyone else. I love the aesthetic of Du Maurier's novels. (Rebecca is by far one of my favorite books.) I think that same atmosphere Daphne Du Maurier created for her readers was truly recreated in this lookbook...that's what I love about all art forms: they make the view/listener/reader/wearer feel genuine emotions. I'm glad it was such a lovely experience for you! You look fantastic and Charlotte's designs are as beautiful as ever. Oh my goodness I just finished viewing the site and absolutely adore these stunning prints, also the visual gifs. What a fun and inspiring shoot this must have been! I agree, the boldness and wisdom of this brilliant collection is what's so alluring to me. Congratulations on being a part of the lookbook! I saw this on Charlotte Taylor's blog a couple days ago and my jaw dropped, then promptly snapped shut. (I figured it wasn't ladylike to leave it dangling.) I'll admit that prints are not quite my thing so I was more focused on everything but the clothes. I love the mood that was set, along with the colour scheme. The deep rich hues of storm blue and purple almost make feel swept away to read some coastal mystery. You are truly beautiful Rosalind. With that incredible bone structure of your face, I'd almost wager that you can't take a bad picture. Oh and don't even get me started on that luscious hair! You look absolutely gorgeous and these photographs are beautiful. 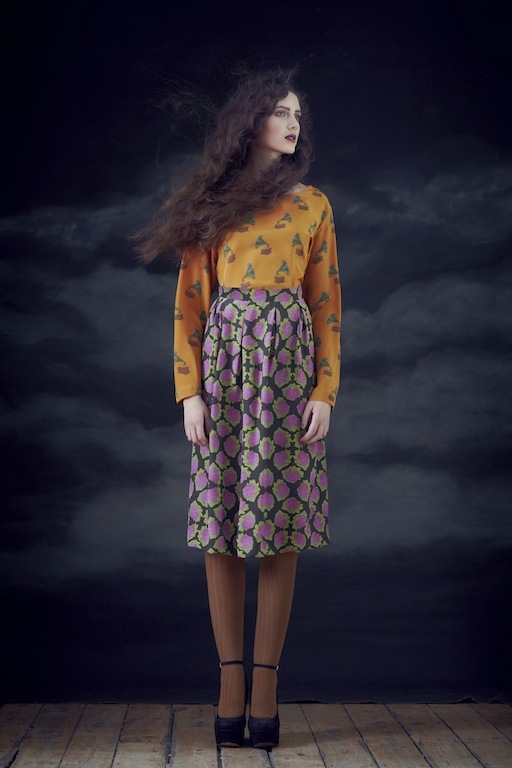 Not to mention the collection is stunning, I love the prints and colors. First of all Rosalind, the shots of you are absolutely stunning - you must be thrilled to have such quirky, beautiful designs in your lookbook! Having spent every holiday I've ever had in Cornwall I have a very strong affinity to the place and feel it is somewhere, within the UK, with which I have dual citizenship. The north west is where I was born and brought up but Cornwall is my adopted residence - a place I hope to live in when I am old and grey so that I can appreciate the landscape completely without having the pressures of a job etc. Because of this I am also a great Daphne Du Maurier fan - and although Rebecca is perhaps her most famous, dramatised and revered novel, Jamaica Inn was the most gripping I have read. It is true what you say - her books can swallow an afternoon because it is necessary to immerse yourself completely in the life of the characters. Due to their settings I always feel there is a sense of timelessness - the elements play a much greater role than any attempt to keep the stories contemporary to the time in which they were set. Her books always transport me back down to that mysterious county with it's legends and folklore and ancient customs. I really appreciate how it has inspired Charlotte's work - the vividly contrasting colours can be seen even from the A30 (Cornwall doesn't need a motorway!) by the great difference between the deep green of the hedgerow and the sunshine yellow of the gorse. Just as Christopher Kane used his Resort 11 collection to express space and the night sky - I wish someone would dedicate a collection to the sea. Maybe they already have - but there are leagues and leagues of possibility there. You look really good here. Your writing is fab as usual. this is such an amazing photo shoot. The owl is a unique and fabulous touch and adds a sense of pure beauty along with the model. The clothing is lovely, it really flatters the figure. hey! que bellas fotos! muy lindas! Wow! The clothes are amazing, and you look amazing in them. I really love the last dress, and the wedges compliment the collection well. I've only read Rebecca and The Birds, but I guess I'll have to check out Jamaica Inn now. You've elevated modeling to the level of art. I loved reading about how you contextualize your shoots and storyboard your experience. Now I'll have to read Du Maurier at last! She's my mother's favorite writer, so it was always as if she kind of belonged to her. You look beautiful of course, but what is extraordinary is the composure and expressiveness you achieve while in a pose. And I loved the patterns as well. Lovely all around! I l-o-v-e these photos, especially the last one. The outfits are beautiful, you look amazing and your hair are SO gorgeous! 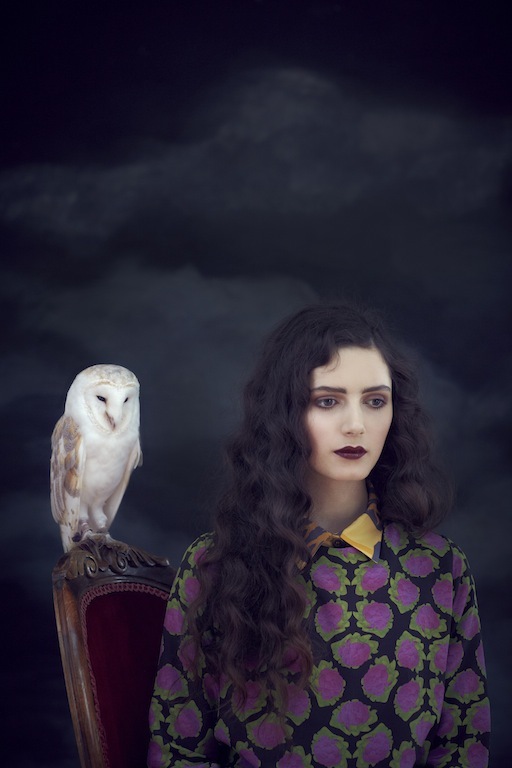 OMG these photos are amazing, so beautiful, and the owl is great. 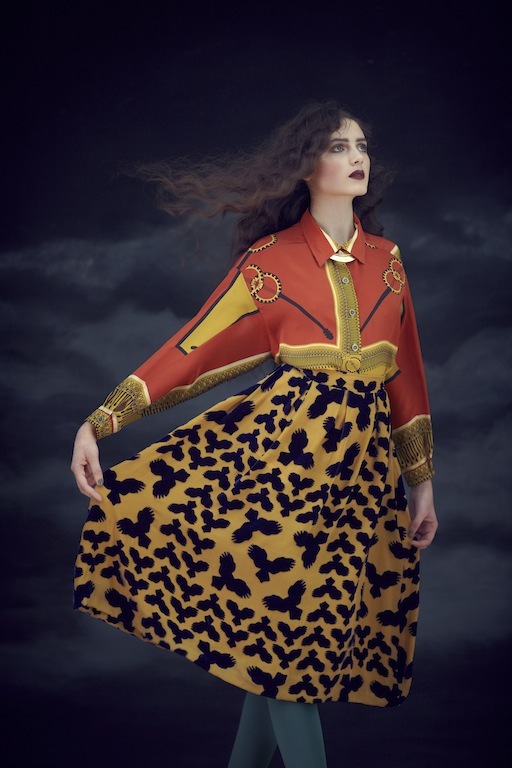 The clothing is all so stunning too, these photos are even more striking than usual! My brain has been over-run by cold germs but I must just say you look bloody amazing here and I am more than a little in love with the owl. The photo-shoot turned out fantastic. I just emailed you saying that I saw these at Charlotte Taylor blog first and was smitten with them. Every single one of these photographs is beautiful, and the gif of the owl moving it's head is delightfully charming, you must have had so much fun shooting with it! The prints are gorgeous and I cannot decide on my favourite! In response to your question about the key necklace- the paint hasn't chipped off as of yet, but I think adding a layer of varnish would add protection from rain and general wear and tear, as well as a lovely shine! I had to take a look at your blog before I wrote a response to your much-appreciated comment on mine. I'm so very glad I did. What exquisite photographs! The fashion is great but even more compelling to me is the choice to use you for this collection. You are more than a model or spokesmodel; you breathe intelligence and beauty into the whole project, making the sum greater than the parts. Just lovely. Thank you. The first pic blew my mind. Thrilled to have found your blog - so new and creative!! Congratulations on your look book shoot! The dark, gothic atmosphere certainly becomes you. Exceptional photographs (and I do love the owl and all he represents.)! I will need to check out Du Maurier's books now. She seems to weave all my favorite elements of art and literature into her text. Oh my goodness, Roz, what a beautiful series! Congratulations, sweet friend. I had come here to say hi - I've been away from all things fashion for so long, literally and metaphorically - and like someone else said, my jaw dropped. The colours, her designs.. I'm blown away. Wise, yes: grown up, intelligent, genius, inspiring design. 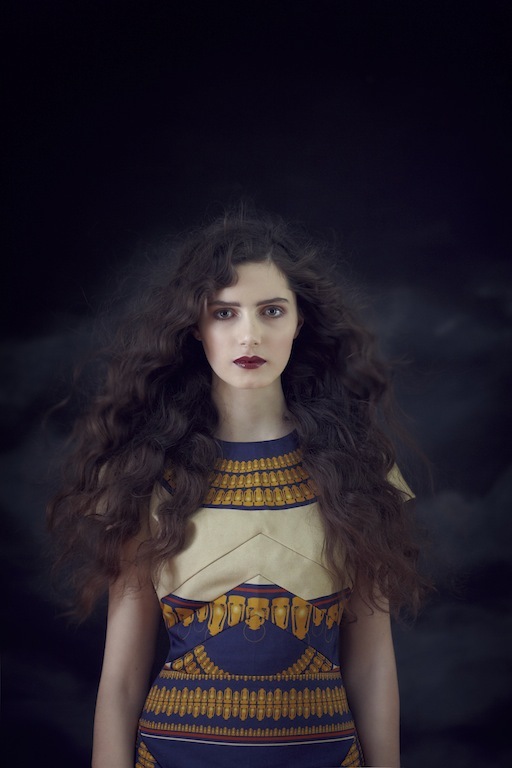 And the way you were styled - hair, makeup, Claire Pepper's wonderful photography - and YOU! I can't even choose my favourite. Perhaps the shot with the trousers: I love your pose. But also the wonderful red/gold/black shirt and wide skirt.. I love it all. I can't believe I've never read anything by Daphne du Maurier, and now that I've finished my own, first, novel, and am allowing myself to read fiction again, maybe I should read her next. I'm currently working my way thru the Michael Dibdin/Zen series. What beautiful photos. The Gif's are amazing. You, look amazing. The clothes are wonderful. What a great post. You are stupendous in the photos. oooh my god, you look perfect, especially with the nmaxi dress !!! I love it, really beautiful pictures and outfits !!! I never tire of coming to see what you are wearing and your expression on your face and your body movements..
i love it it´s perfect. Holy wow, you are a stunner Rosalind!!! Love that we get to see some of your modeling work. It's a very beautiful collection, and I love the story behind Charlotte's designs. Fantastic job to everyone involved in the shoot! Oh so beautiful! Everything - you, the styling and the clothes! This is marvelous! Congrats on your great work, I must say; I absolutely adore her designs! The owl is such a beautiful creature, and so are you, dear Roz! I am speechless, deliciously dark and beautiful! Hmmm, what can I say that 42 others haven't said already? I think I'll go with 'slamming'. I'm so glad you are still enjoying the opportunity to model. I have to admit, I have had my eyes opened to the world of commercial modelling in Paris and it is far from pretty. The way the girls are treated is so despicable. I am completely with Erin O'Connor when she campaigned for a Models Union to protect girls. And the industry in the UK is far more supervised than in France. I think the best way is to manage yourself, work with people you know and love, and make beautiful, rare pictures as a result. Wow! These are really stunning Roz. Absolutely stunning. These photographs are pure perfection. I am definitely going to checkout the look book. I lice her designs. The owl is so beautiful. Ive always thought was were so secretly magical & majestic. Wow! Just having a quick catch up on your blog and have just seen these photographs. TOTALLY STUNNING! You look beautiful. I particularly love the top one. I've just come across this blog post and I have to say Rosalind you look absolutely stunning!